Nazarbayev Resigns As Kazakhstan's President; Was First Elected In 1991 Nazarbayev is the only president Kazakhstan has ever known. He first rose to authority as a Communist Party official — and he's been accused of human rights abuses. Kazakh President Nursultan Nazarbayev says he will leave his post after nearly 30 years in office. He's seen here at the Akkorda Palace in Astana, Kazakhstan, in 2016. Kazakh President Nursultan Nazarbayev says he will resign the post he has held for nearly 30 years, abruptly announcing the end of an era that began in the early 1990s. But Nazarbayev, 78, also said he'll keep several key official posts, in a speech that aired on national TV Tuesday. In the former Soviet bloc, formerly comprised of 15 countries, Nazarbayev is the only longstanding leader to sustain power for three decades. The president of Uzbekistan, Islam Karimov, died in 2016 after his presidential reign of 26 years. Despite resigning the presidency, Nazarbayev will maintain control of the ruling Nur Otan Party. He'll also remain a member of a powerful government council. "In accordance with our laws, I'm given a status of the first president - the nation's leader ... I will remain the Security Council's chairman, who has serious powers to determine the country's domestic and foreign policy in line with the laws," Nazarbayev said, in a translation by Russia's Tass news agency. "In July 2018, the Security Council's status was changed from consultative to constitutional, increasing its authority, and Nazarbayev became its chairman for life," Radio Free Europe reports. 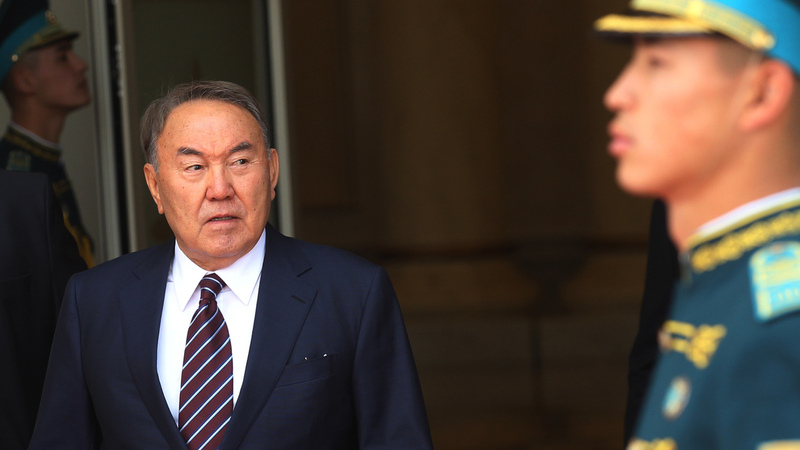 In late January, Nazarbayev asked Kazakhstan's Constitutional Council to clarify Section 3 of Article 42 of the Constitution, laying out a path for his early resignation. On Feb. 21, Nazarbayev dismissed the entire Cabinet and reassembled it, [criticizing state officials] as unable "to listen to listen to people's problems," according to Eurasianet. "No systematic work was done. The real incomes of the population have not increased. Spending on food as a share of the family budget is growing," Nazarbayev said at the time. Nazarbayev has been a dominant force in oil-rich Kazakhstan. He's also often been accused of abusing human rights and of using autocratic methods to maintain control, amass power and influence elections. And then there's the cult of personality Nazarbayev has developed in the former Soviet Central Asian republic. Kazakhstan celebrates holidays on both the president's birthday and on the anniversary of his first election. And in 2006, Nazarbayev changed the lyrics to his country's national anthem. In 2017, one of the main streets in the former capital of Kazakhstan, the city of Almaty, has been renamed after him. Nazarbayev is the only president independent Kazakhstan has ever known. He first rose to authority in the 1980s as a Communist Party official under the Soviet regime, which appointed him president shortly before the U.S.S.R.'s collapse. In 1991, his presidency was affirmed by an election in which he took nearly 100 percent of the vote. Since taking power, Nazarbayev has won five new terms, with lopsided results: In each of his last two elections, he won at least 95 percent of the vote. During his tenure, Kazakhstan has gradually shifted the terms in office for the presidency. The terms were once for seven years; that changed in 2007, when the term was shortened to five years. Nazarbayev won his last election in 2015 — a vote that was shifted one year early, reflecting a fluctuating election schedule that has been a hallmark of the president's decades in office. The news about his resignation caught a prominent Kazakh political analyst Aidos Sarym by shock and surprise. He said he thought that Nazarbayev would never step down. "This is an interesting move, which sets a model for controlled transition of power," he told NPR in a phone interview Tuesday. "This is the man who wants to make history." Sarym said. Sarym sees the most recent rearrangements in the Cabinet to signal that "the situation is changing; however, the fundamental policies are staying intact." Speculation that Nazarbayev would step down has been circulating for 10 years, according to Joanna Lillis, a foreign correspondent based in Almaty, Kazakhstan, who recently published, Dark Shadows: Inside the Secret World of Kazakhstan. "Nazarbayev is such an institution in Kazakhstan. He is the only president that the country has ever had. It's especially hard for young people to imagine Kazakhstan without him," Lillis told NPR. "Although the authorities are clearly trying to make this a smooth, managed and predictable transition, still it creates uncertainty because the president who ruled Kazakhstan for 30 years is leaving." Nazarbayev's resignation plan was designed to assure him "a special constitutional role that would safeguard his own interests," Lillis said. "Not only did the 2010 Leader of the Nation Law give him say in policymaking, but 2018 changes to the law made him lifetime Chair of the Security Council." The chairman of the Senate of Kazakhstan — a prominent diplomat Kassym-Jomart Tokayev, who has been prime minister, secretary of state and foreign minister — will be interim president for the rest of the term, scheduled to end in April 2020.